The locals call it “mer d’huile” , which means Sea of Oil. When it’s so calm and glassy, the surface of the ocean is silky smooth like oil. 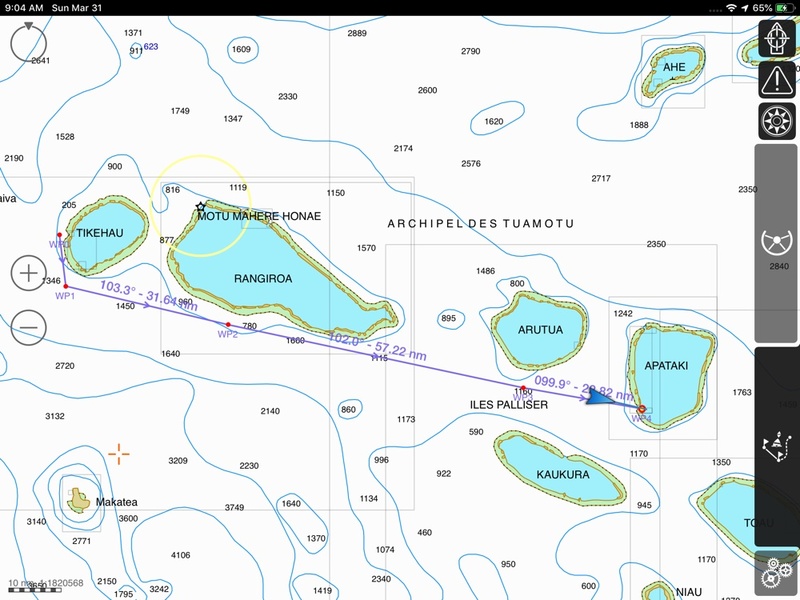 That’s how it was all the way from Tikehau to Apataki, 23hrs under motor, heading east 125nm total distance covered. Picking a calm day is one of two approaches when going east against the prevailing easterly trade winds. The other approach is picking a day with north winds. In that case, you must watch out for squally weather, as northerlies are indicative of frontal systems; but you can save lots of money on fuel! Just how much savings? See below. Diesel Consumption of motoring 23hrs: 1.1 gallons/hr = 25 gallons used (total 100 gallon tank). Cost of motoring to Apataki: $145, plus emission of CO2 into atmosphere, and wear and tear on engine. There is a big advantage of motoring overnight: this charges the batteries FULLY. It is our surrogate for going to a dock with shore power (which we haven’t done in 3 years). Most boats have generators + wind turbines to charge batteries, but we only have a 9 solar panels (~900watts). You ask, “why doesn’t the solar array charge the batteries?” Yes, but usually only to 90%. The last 10% takes a looong time because the charge controller restricts the amount of amperage. The equivalent is like trying to fill a water bucket with a hose— as it fills up, you must turn down the water pressure, to prevent water from spilling over. So the batteries can’t accept the full production of the solar array for the last 10% of their capacity. The result is that the chemical plates start to get hardened, without equalizing fully, the batteries can have premature death. That’s what happened to our last battery bank, which only lasted 3 years due to us never going to a dock and charging with shore power all the way. That’s a long way of saying that the diesel costs a bit, but we don’t have the cost of a generator onboard… so if this is saving our batteries a little bit (which cost $1500 to replace) it seems to balance the equation out. Wow Kristian–I love following your trajectory especially when I’m in the midst of tense real estate deals! Just wondering if you’ve ever stopped by Kaukura and seen the remains of the St. Lary we lost there so many heartbreaking years ago. Oh wow yes, we sailed right by Kaukura with Alex aboard, we got blown off course by the wind, and had to dodge the island, and I thought hum… this is how things start getting sketchy. Do you think the wreck is still there, and if so, where? I’ll need to go pay our tribute. Very nice, full, in-depth explanation Capt K.
Thanks Michael. Being permanently off-grid feels like I’m running my own electrical utility… with all the associated mishaps. When we were sailing across the Pacific I thought everything was pretty copacetic. Then 6 months later the batteries started plummeting. Now I’ve learnt there’s more about “battery maintenance” than meets the eye.